AMID the unpredictable weather, protest chants were still heard while different artworks illustrating the protesters’ pleas were seen on the streets during the commemoration of the 46th anniversary of the declaration of martial law, afflicting the apathetic more than ever. The dictatorship of former President Ferdinand Marcos was an era of blatant oppression and human rights violations. Unfortunately, up until now, there are still people who are subscribed to the distorted version of what really happened during the martial rule. Today, critics and artists claim that President Rodrigo Duterte is treading the same path as the late dictator. Hence, they set their sails to express their stands in the most eye-catching way. 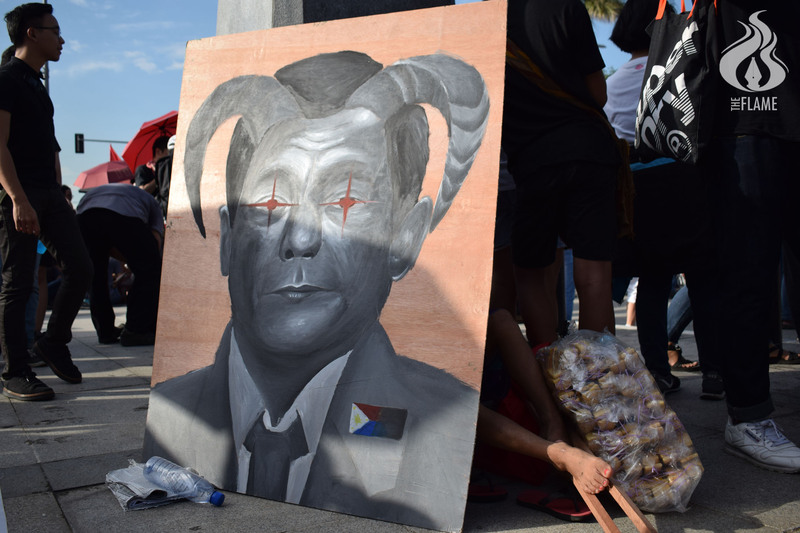 A portrait from University of Santo Tomas (UST) Anakbayan depicts Duterte as a demon with horns and glowing red eyes clad in a suit. “Duterte is a demon because he cannot be satiated with his imposition towards Filipinos. Ever since he sat down as the president, he has been carrying out anti-mass policies in the likeness of neoliberal attacks towards laborers,” said UST Anakbayan member Ronel Reyes. Other posters used humor to tackle the issue through timely memes. According to Restituto Aguinaldo, it is important to utilize what is interesting for today’s generation to easily spread awareness online and to strengthen the stance of the people. 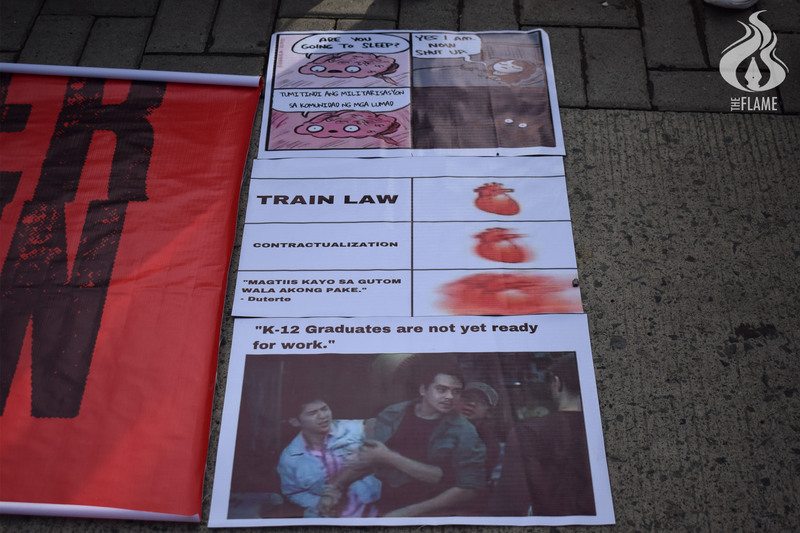 “[These posters] are [meant] to reach out to the youth, [to show] that the existing martial law in Mindanao is an implied dictatorship of the present regime, so that what transpired during Marcos’ regime would never again happen,” she said. 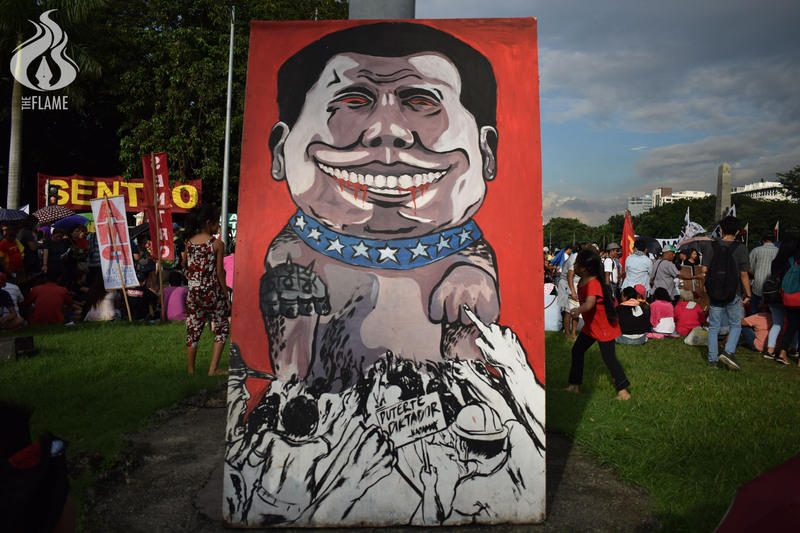 Meanwhile, an editorial cartoon resting on a pole stood proudly with its bright red background featuring the head of Duterte with the body of a dog whose blood is trickling down from his mouth to chin, wearing a blue collar with stars on it representing the United States, and bearing an iron right hand while the masses protest below him. The artwork belonged to activist group Kalipunan ng Damayang Mahihirap. Member Michael Beltran said the portrait was inspired by how the Philippines is still being controlled by the US all while the president is displaying the power of his iron hand through the martial law in Mindanao. One of the largest and boldest effigies during the rally that one would surely not miss belonged to Anakbayan’s Panday Sining and was made by member Kyle Placio. The effigy shows an image of a Cerberus, a creature from Greek mythology known as the three-headed hound of Hades. It bears the heads of former Presidents Gloria Macapagal-Arroyo and Ferdinand Marcos with the Duterte in between them. Above their heads are two trains with arrows pointing upwards signifying the Tax Reform for Acceleration and Inclusion (TRAIN) Law and the high inflation rate the economy is facing today. 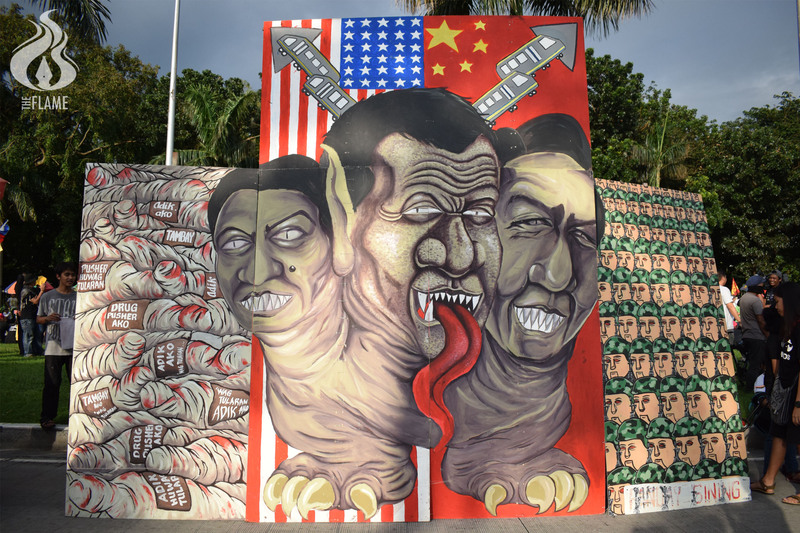 The background is composed of the American and Chinese flags, signifying that the Philippines is still a colony of the US and that Philippine territories are being hoarded by China. On the right side is the image of militarization, while the left side symbolizes the victims of the extrajudicial killings.